Driving Ring Road, Western Iceland - Hej Doll | Simple modern living by Jessica Doll. With lots of driving ahead of us, we awoke early and headed down to a local coffee shop for breakfast. On the road again took us once again off Ring Road onto a gravel one for hours on end. We ventured out onto the Snaefellsnes peninsula, stopping along the way and in the town of Stykkishólmur. This area was one of our favorites, and felt like one of the more magical areas of Iceland. We passed perfectly shaped mountains and volcanic areas, including a huge crack (Rauðfeldsgjá Gorge) in the side of the mountain that you can very easily hike to and explore. You’ll need a flashlight if you plan to go more than a few feet inside. 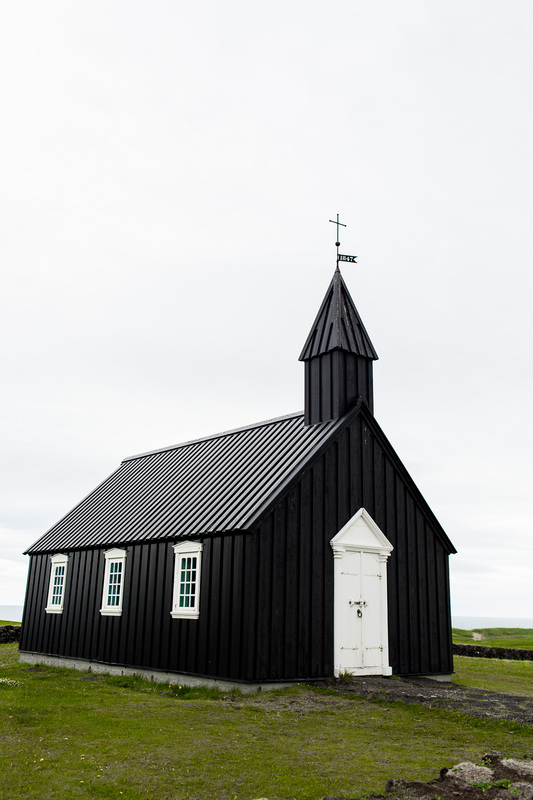 After a quick stop to see one of the oldest churches in Iceland in the tiny town of Búðir, we made our way to a cabin in Hellnar for the night. We cooked dinner there and then walked along the moss-covered lava-rock coastline. We didn’t come back to our cabin until almost midnight, a great perk of having the daylight last so long. The day before we passed a road that leads to a Snæfellsjökull, so the next morning we drove over to check it out. Unfortunately the visibility wasn’t great so we weren’t able to make it to the glacier, but continued along our way. We stopped at a beach called Ytri-Tunga that had a few seals and pinkish sand to explore before heading on to Reykjavik and the puffin tour we had booked a few days prior. Parking in Reykjavik was not my favorite, as I somehow had trouble with the automated parking machines. Luckily a nice local stepped in to help me, probably because I was taking so long. I thanked her profusely and we checked in to our tour. Though the tour was only an hour long, we saw plenty of puffins. Thousands. We also learned that they are sea birds, not land birds. The way they fly reminds me a little of fat and drunk hummingbirds, flapping their wings up to 400 times a minute just to keep themselves in the air. Once in the water though, they are excellent divers. Diving to depths of up to 200 feet, they can also hold an average of 15 fish in their beaks to bring back to their partner and young. After the tour we went for a walk along the main area of town and had to see the top of the Hallgrímskirkja Church tower. The view from the top offers a near 360-degree view of the town of Reykjavik. From there we headed east, once again. For the full details of our trip around Iceland, see my Guide to Ring Road. Click here to read all of my posts on Iceland. Sorry, not sorry for all the photos in this post. Aerial photos by my husband, Steve Doll, as always. This is absolutely stunning. Your photos are seriously breathtaking!